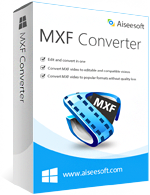 Aiseesoft MXF Converter, the professional and flexible MXF/P2 MXF Transcoding Software, offers the best MXF converting solution for users of Panasonic DVCPRO P2, Sony XDCAM, Canon XF camcorder, or any other camcorders that shoot videos in MXF format. This amazing software can convert MXF files for editing in various video editing software, such as Sony Vegas, Adobe Premiere, Avid Media Composer, Windows Movie Maker, Magix Movie Edit Pro, Ulead DVD MovieFactory, Cyberlink PowerDirector, and so on. Put MXF recordings on The new iPad, iPhone 4S, Galaxy Tab, and Xoom, etc. If you need more information please contact the developers of Aiseesoft MXF Converter (Aiseesoft Studio), or check out their product website.